Dr. Ken’s Toenail Fungus Fighter is a product made by Utopia Silver Supplements. It aims to cure toenail fungus through a solution, which is dropped onto the affected toes. Dr. Ken’s Toenail Fungus Fighter comes in a small brown bottle with a simple white label. I was unsure whether or not Dr. Ken’s Toenail Fungus Fighter was a product worth buying, so I did some research into whether this is a product which holds up. Ingredient list only mentions a small line that says with regular usage the fungus should turn dark brown or black and grow out. The dosage for Dr. Ken’s Toenail Fungus Fighter is 1-2 drops per toenail, 3 times daily. As the product works, the fungus should turn dark brown or black and grow out, at this point people should have 1 drop per nail daily. To inhibit new fungal growth, people should continue to use Dr. Ken’s Toenail Fungus Fighter at 1 drop per toe nail 1-3 times per week. 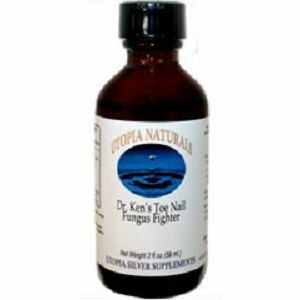 Dr. Ken’s Toenail Fungus Fighter is offered for $19.95 per 2 oz bottle. The bottle has about 60 droppers full of solution; each full dropper having about 20 drops, which is the recommended serving size for regular usage. This means that each bottle of Dr. Ken’s Toenail Fungus Fighter should have enough solution for 20 days. Dr. Ken’s Toenail Fungus Fighter does have a money back guarantee, which is of some comfort for buyers. You will receive a full refund for products returned within 60 days. I could not find any reviews for Dr. Ken’s Toenail Fungus Fighter, which is a concern when deciding to buy a product. I also could not find a breakdown on the product’s effectiveness or specific ingredient list. Jack Stevens	reviewed Dr. Ken’s Toenail	on November 1st	 and gave it a rating of 2.5.